2018-11-09 - Adair County Courthouse Annex, Columbia, KY - Photo by Linda Waggener, ColumbiaMagazine.com. 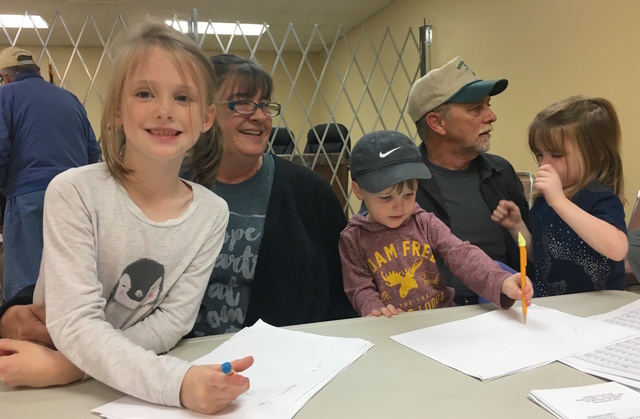 Adair County Treasurer Melinda Quinn and her husband Randy were joined during the vote counting Tuesday evening by their grandchildren, from left, Maddie, 7; Jase, 2; and Ellie, 4. The little ones were pretty patient with the process even though they couldn't quite understand why all the attention had to be on all those numbers flying around. They are the children of Beth and Jeremy Wethington, all from Knifley.